Since a picture is worth 1000 words, the picture above should represent about three blog posts worth of insight. I first recognized the interrelationships among the various aspects of life writing over a year ago and included a simpler graphic with a post, The Life Writing Progression, on July 5, 2009. Sarabelle gifted me with this picture last month while I was preparing material for my Writing for the Health of It class. I’d been thinking about the core Story (capital S) that defines us, and how everything we write grows out of that Story and expresses aspects of it. I was considering how some of our writing is deeply personal and earthy, best left out of sight and unshared. That root writing leads to insight and imparts power to our words and voice as we write publicly visible stories and essays. When I began pondering the role of memoir in tying together the loose ends of life, and recalled that memoir is composed of the brush strokes of smaller stories, Sarabelle whispered, “You're thinking of a tree.” Sure enough, the image of a tree came clearly to mind. After I studied it a few minutes, she whispered again, "Now, draw it." That advice seemed a bit odd since I don't pretend to be an artist. But I began doodling. One more element appeared as I worked on the picture. I had not realized that the soil the tree grows in also plays a role. That soil is composed of memories. Our root writing draws nutrients from raw memory, converting them to the empowering energy required for the tree to grow, forming branches and leaves above ground and more roots below. The longer I think about this tree and the organic wholeness of the life writing process, the more excited I get. We grow individually by writing about our own lives, and we grow collectively as we share stories and provide safe spaces for affirming and supporting each other. As the seasons change and the tree matures, its leaves compost into the soil of memory for future generations, helping life go on. So there you have it — the Tree of Life Writing. Ponder it and let it speak directly to you as it has to me. 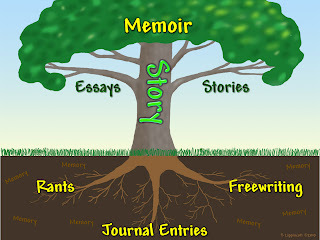 Write now: do some writing practice on the way your life writing fits into this tree concept. Are you limiting it to certain forms? 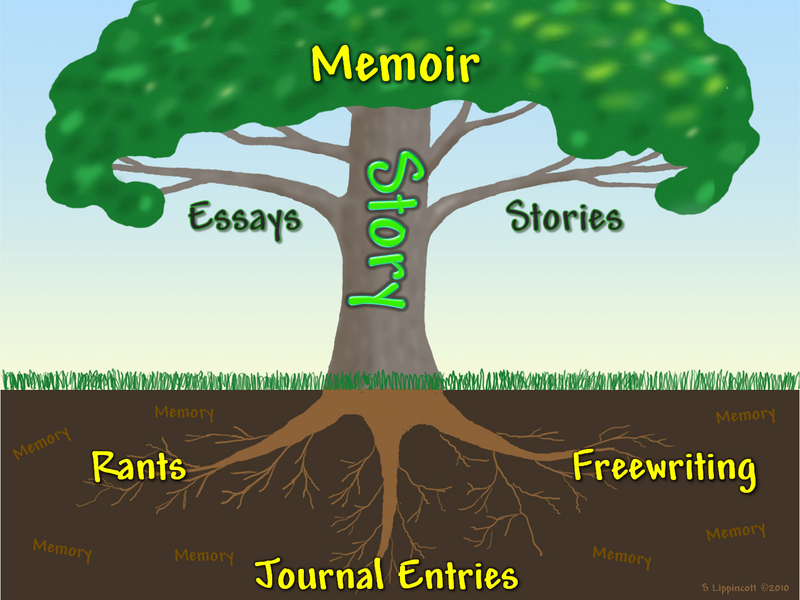 Would your writing and your life benefit from branching out into other forms? Try a form you haven’t explored lately or at all. Great graphic! Who says you are not an artist! I love it! Sharon, I love the picture and the blog post. I see story and all the sub-categories that way too, and even include narrative poetry and autobiographical fiction to my branches! Linda Joy, what a great idea to add those two additional branches. I'll draw them on in a new version. Thanks a bunch.